The Argentina captain, Lionel Messi, has added yet another trophy to his collection. 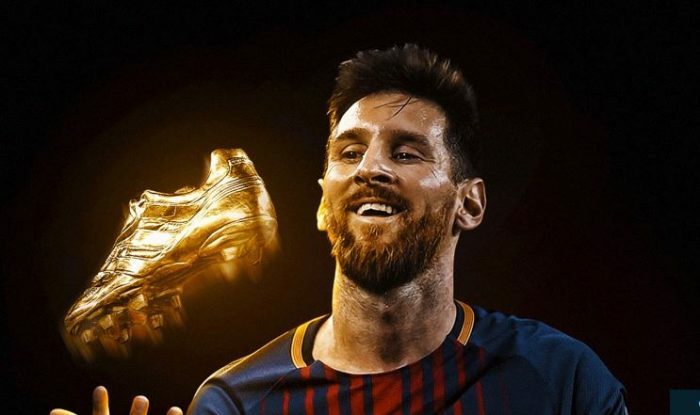 The Barcelona forward equaled Cristiano Ronaldo’s tally of four European Golden Shoes after receiving the award at a ceremony on Friday. He claimed the prize given to Europe’s top goal-scorer, for his 37 La Liga strikes in 2016-17. It is the fourth time Messi has taken the honours, after his successes in 2010, 2012 and 2013. His tally came from 34 top-flight games and saw him top the charts ahead of Sporting CP’s Bas Dost, who netted 34 in the Primeira Liga, while Borussia Dortmund’s Pierre-Emerick Aubameyang rounded out the top three with 31. Ronaldo, winner of the award in 2008, 2011, 2014 and 2015, scored 25 league goals last season and did not make the top five. Last year’s winner, Luis Suarez was fifth this time around with 29, one fewer than Bayern Munich’s Robert Lewandowski.